Accent your Garden with Something Special! A garden center can be a combination of a furniture store, art gallery, pet supply stop, music outlet, entertainment center, and education spot. Because of the popularity of gardening, the array of garden-related items is as varied and vast as gardeners themselves. Garden enthusiasts will look for furniture items of structural and architectural interest to contrast with the natural beauty of plants. Other accent pieces, once termed “lawn décor,” have come a long way since pink flamingos and gazing globes were all the rage. But like most trends that seem to repeat themselves over time, these retro garden items have gained a new acceptance in the Toledo, Ohio, area. With fabulous results, many artists in northwest Ohio have turned their craft to creating items for decorating gardens. Whether it’s stone, metal, glass, or pottery, there’s a huge demand today for all garden art. 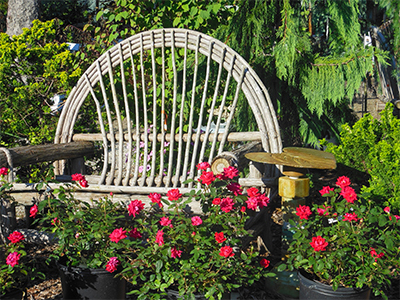 Stop in and see firsthand why Oak Park has made garden art a focal point in its landscape design center.